Set in the learly 1980’s, Abby and Gretchen have been friends for years. They became friends when Gretchen was the only one to show up to Abby’s ET themed birthday party. Quickly, their friendship became intense, with constant sleepovers. But in high school, the girls are part of the popular group; Abby, Gretchen, Glee, and Margaret kind of rule the sophomore class. One night, the four are at Margaret’s family’s lake house, and they decide to try acid together. None of them feel anything, except Gretchen, who starts acting impulsively. After suggesting skinny-dipping, she disappears into the night. Abby finds her much later, bedraggled ad bloody. After that, Gretchen is different. This book takes no time to get into the grit of it. After just a few chapters of early friendship and background, we’re at the lake house, wondering what the heck happened in the woods. And soon after, we get to see the way Gretchen is changing; her unkempt appearance, strong scent, and bags under her eyes make her look worse than the walking dead. But Abby stays by her side. 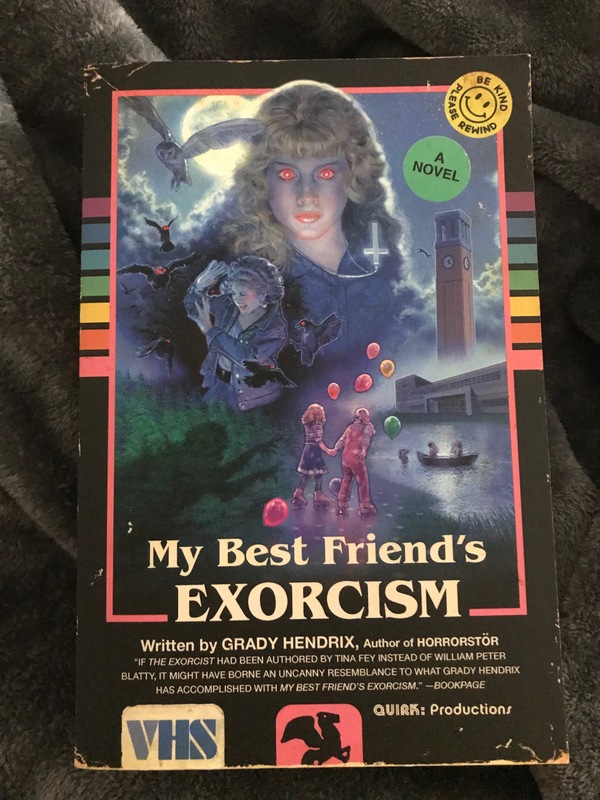 My Best Friend’s Exorcism is a phenomenal read. I fell in love completely with Abby. She’s a bit of the odd man out, and I can definitely understand that. She also just wants to help her friend, when no one else does. It’s very pure and sweet, and I adored it. I also loved that Hendrix was unafraid of getting dark and gory! This book had some scenes that were all but tangible with his descriptions, and had me a bit chilled. I hope you get a chance to read My Best Friend’s Exorcism. It’s a lot of fun, a bit dark, and lives up to the vhs-style cover! Plus, when you’re done, you can go on spotify and listen to the chapter songs here! You can grab a copy of My Best Friend’s Exorcism on Amazon, Barnes and Noble, or anywhere books are sold. Happy Reading!